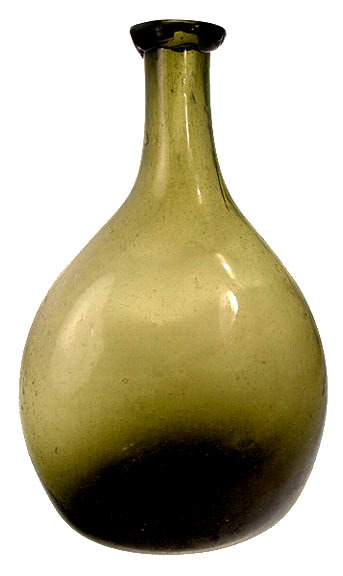 A Chalmers Catawba wine bitters bottle graded 9.8 for condition and considered one of the top five western bitters known, sold for $ 19,600 in an Internet and catalog auction that ended Jan. 18 by American Bottle Auctions (AmericanBottle.com). 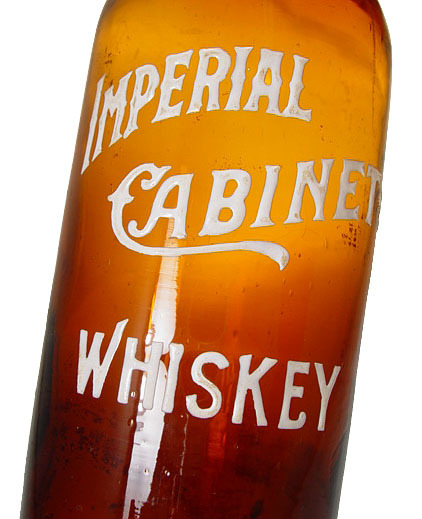 This Chalmers Catawba bitters bottle sold for $19,600 in an online auction. PR Log (Press Release) – Jan 22, 2010 – (SACRAMENTO, Calif.) – A Chalmers Catawba wine bitters bottle graded 9.8 for condition and considered one of the top five western bitters known, sold for $ 19,600 in an Internet and catalog auction that ended Jan. 18 by American Bottle Auctions (www.AmericanBottle.com). The bottle was the top lot in a sale that saw around 325 rare and vintage bottles sold and grossed more than $275,000. It was the 49th Internet and catalog auction for American Bottle Auctions, which specializes in rare and vintage bottles mostly made between 1850 and 1900, the period most desired by collectors, when superior embossing techniques were employed. Nearly 5,000 people registered to bid, but only a fraction of that total (around 300 people) actually submitted bids. Of those, 175 were winning bidders. Following are additional highlights of the sale. All prices quoted include a 12 percent buyer’s premium. A “For Our Country/Eagle” pint flask, over 150 years old, with sheared lip and pontil, in a color best described as tobacco green with striations of olive, soared to $14,560. The bottle was graded 9.8 and depicted a 20-star flag surrounded by six ribs. Also, a Baltimore Sunburst half-pint (circa 1840-50), graded 9.8, in a light to medium pinkish copper color and a superior high-quality example, hit $11,200. A spectacular Bridgeton New Jersey-Washington bottle with sheared lip and jagged tubular pontil, graded 9.8 and with an outstanding medium to deep amber coloration near the base, climbed to $10,080. Also, a flawless Miller’s Extra E. Martin Old Bourbon trademark, probably the most desired of the Cutter fifths, with strong embossing and an overall beautiful patina to the glass, rose to $8,960. A Washington/Baltimore Glassworks portrait pint flask showing the Baltimore Monument and a bust of George Washington (circa 1830-50), with rolled lip and pontil, graded 9.3, medium green and somewhat crude, with surface irregularities, breezed to $8,400; and a Corn For the World quart flask with embossed corn and the Baltimore Monument on the reverse, graded at 9.8, commanded $7,840. A trademark Lightning quart jar, with Putnam 328 on the base and a replaced top and painted lid, boasting overall nice whittle and emerald green in color (one of only six such jars in this shade), graded 9.8, coasted to $7,280; and a J.H. Cutter Old Bourbon (E. Martin & Co., Sole Agents) banded pint flask, with a popular crown on the shoulder and a single roll top, graded 9.3, gaveled for $5,376. A National Bitters (with Patent 1867 on the base) bottle, with an applied top and, remarkably, still with the original label, rare for its beautiful and brilliant ruby red coloration, graded 9.9, climbed to $5,152; and a Jesse Moore (Hunt & Co., Sole Agents) western whiskey fifth bottle with gorgeous pint banded flask, wonderfully embossed but with some condition issues, graded 9.7, topped out at $3,808. A Pineapple bitters bottle, unembossed, with applied top and smooth base, green with some yellow and graded 9.8, hammered for $4,928; a Henley’s Wild Grape Root Bitters bottle with tooled top, in a highly whittled aqua-teal variant and filled with bubbles, demanded $4,256; and a Bryant’s Stomach Bitters bottle with applied top and sticky ball pontil, brilliant emerald in color, fetched $4,032. 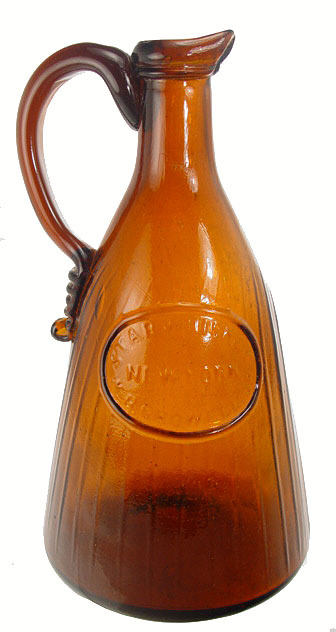 A National Bitters (Patent 1867 on the base) bottle, with applied top and colored a brilliant yellow with a touch of green (almost transparent yellow toward the top, becoming a more vibrant hue near the base), graded 9.8, sold for $4,032; and a Harkness Fire Destroyer extinguisher (circa 1865-85), with ground lip, 6 ¼ inches, unusually colored in sapphire blue and pure oxblood puce, brought $4,032. A trademark Lightning half-gallon jar, showing Putnam 368 on the base and with the original closure, in a stunning olive color and graded a respectable 9.8, went to a determined bidder for $3,808; and a Dr. A.W. 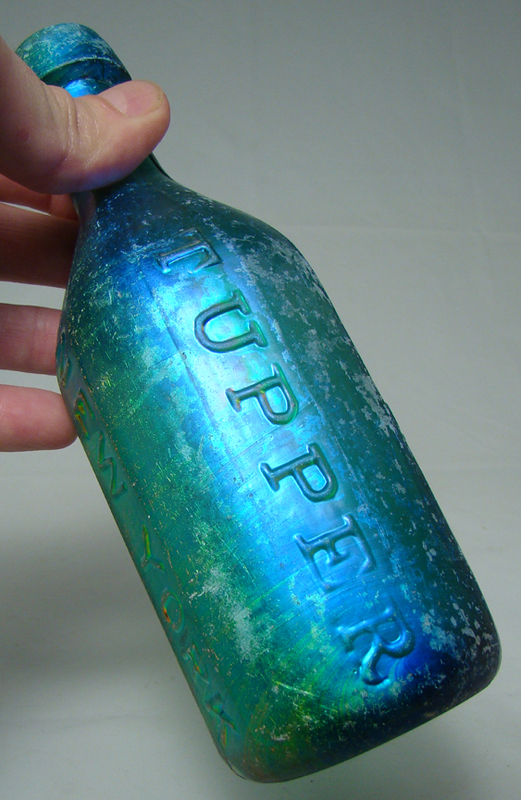 Coleman’s Anti-Dyspeptic and Tonic Bitters bottle, 9 ¼ inches, made in Mobile, Ala., and in a beautiful green hue, graded 9.3, an example of one of the earliest bitters made, brought $3,808. American Bottle Auctions was founded in 1990 by Jeff Wichmann, a native Californian who has been collecting antique bottles for nearly 40 years. Over time, the firm grew and underwent a name change, but the focus has remained the same: American Bottle Auctions specializes in appraising, brokering, consigning and auctioning antique bottles and glass. Bottle collecting is a burgeoning genre. Mr. Wichmann has personally researched, appraised and estimated the values of thousands of antique bottles and related items. He is often called on to appraise antique bottles and glass for private individuals and businesses. In 1999, he wrote and published The Best of the West – Antique Western Bitters Bottles, a top research guide. He has also written many articles on the subject of antique bottles. American Bottle Auctions is always accepting quality consignments for future sales. To consign a single bottle or an entire collection, you may call them toll-free, at 1-800-806-7722; or, you can e-mail them, at info@americanbottle. The next auction is tentatively slated for late April or early May. Already, fresh groupings of bitters and historical flasks have been consigned, and marbles may be sold. Ken Hall writes pre-sale and post-sale press releases for auction houses, for a fee. He writes, submits and tracks stories for clients. Submissions are published in trade magazines, posted on industry websites and appear in local newspapers. That is some inspirational stuff. Never knew that opinions could be this varied. Thanks for all the enthusiasm to offer such helpful information here. Hey, just wanted to let you know that your page was not showing properly in internet explorer 8 but after few refreshesh it was fine again. Keep up the good work. Thank you for the great information. I look forward to seeing more articles and what else you have to offer! We just couldnt leave your website before letting you know that I really enjoyed the quality information you offer to your visitors… Will be back soon to check up on new stuff you post! Helpful blog, saved your website in interest to read more information! I have desired to write something like this on my webpage and this has given me an idea. Cheers. So empty bottles are valuable I see, I have a Jesse Moore Hunt Bottle from San Francisco with the original contents in it. Is there a good way to find value?? You can see San Francisco imprinted on the cork still. Good web site! I truly love how it is easy on my eyes and the data are well written. I am wondering how I might be notified whenever a new post has been made. I have subscribed to your feed which must do the trick! Have a great day! Genuinely helpful appreciate it, I reckon your audience might probably want a whole lot more blog posts of this nature continue the great effort. Hey mate, this is a great post – It really made me think, keep it up! I dugg some of you post as I thought they were very useful very useful. Hey there just wanted to give you a quick heads up and let you know a few of the images aren’t loading properly. I’m not sure why but I think its a linking issue. I’ve tried it in two different web browsers and both show the same outcome. You are correct sir! Seriously we launched the site and the auction photos weren’t included, well they were but not viewable. So they are being loaded as I write this and our past auctions section will be open and ready to use. It’s a very handy thing to have, you just type in a bottle name and up comes any we’ve sold in the last 25 auctions or so. Thanks for the heads-up. Heya! I’m at work surfing around your blog from my new iphone 3gs! Just wanted to say I love reading your blog and look forward to all your posts! Keep up the excellent work! Hi, this is actually a nice posting. You get my vote for Chalmers Catawba bitters bottle climbs to $19,600 at American Bottle Auctions sale | American Bottle Auctions and also I will bookmark your blog now. Hi! I wonder if it’s rude to ask a question on the comments section of your blog post? I’m searching the internet for information on a glass jar I’ve found in my attic, and it seems something similar is mentioned in your post! Would you know anything of the value of a jar with ‘Trademark LIGHTNING’ on the front, ‘Patd Apr 25 82′ on the top, and ‘Putnam 328′ on the bottom? The jar seems to be in very good shape, with no cracks or scuffs. The metal closure is rusty, but still works perfectly. The jar contained various wooden spools. Hi, how’s it going? I hope you are doing well. I wanted to say that I like this post. Chalmers Catawba bitters bottle climbs to $19,600 at American Bottle Auctions sale | American Bottle Auctions is a nice posting. I am about to take more time looking into this issue. Pretty! It has been really a great post. Thanks for giving this data.